This report contains information about the incident location, a description of the incident, the units on scene, and maps of the incident scene. Use training report to track and disseminate training scenarios to your team. This report contains the name of the training, the description of the training, the steps required to complete the training, and maps of the training group. Leverage the tools in IncidentSmart for more effective pre-incident planning. This report contains the name and address of a location, a description of the site, a list of hazards that exist at the location, as well as maps of the location. The mapping tool is what makes IncidentSmart fun! You'll be amazed how quickly you can create professional-looking aerial view of your fire scene with this easy-to-use feature. The multiple maps feature allows you to include many different maps in your reports. 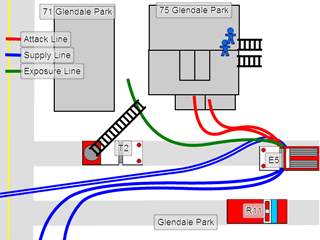 This allows you to name and diagram different floors, divisions or sectors within an incident, or to have a wide area view of the entire incident, with close up maps for target areas. There are a number of different icons that you can use to make your map. Upload an unlimited number of documents and images to your reports. Use the IncidentSmart mapping tools and icons on top of the images that you upload. This gives the ability to send a link to a report to a colleague. You can also give specific people access to view your private reports. You are able to hide your reports from public view. This will allow you to create reports that are internal to your organization, and to choose who gets to see your reports. You can access IncidentSmart from anywhere you have an internet connection. On your phone, your tablet, your MDT, or back at the fire house on your desktop. IncidentSmart has been optimized for mobile devices, and has specific features to allow quick access to pre-incident plans while enroute.